The new fully reversible Axim LK-2100 standard duty deadlatch range offers specifiers a cost effective non handed deadlatch. 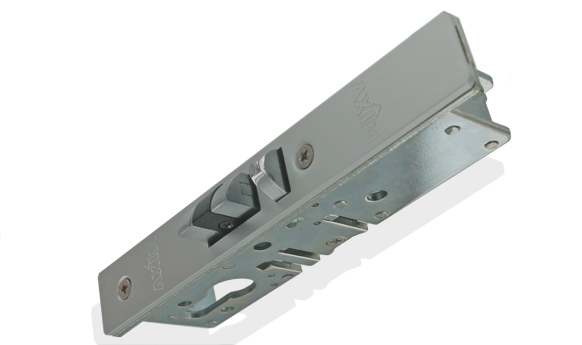 The Axim LK-2100 deadlatch allows installers to carry one stock item instead of two which equates to a reduction in stock levels therefore achieving cost savings. The Axim LK-2100 reversible deadlatch offers the flexibility of traffic control during and after business ours. The Axim LK-2100 deadlatch features a fully non-handed reversible latch bolt. A reverse turn of the key while the bolt is held retracted retains the latch bolt in the case, allowing two-way traffic hich is ideal for use in busy commercial applications e.g. hospitals, banks, shops which may require free access and exit at certain times, and controlled access and free exit at other times. The Axim LK-2100 deadlatch product is an ideal product to be used and specified alongside the Axim ES-2100 Electric Strike range offering a remote access control solution for doors. Axim’s innovative development solutions on the LK-2100 Reversible deadlatch make the LK-2100 series a market leading product which now surpasses other leading brands.